This week Apple unveiled some new Watch designs - gold and rose gold in ionized aluminium, along with some new Hermés straps - but it's also quietly killed off some of the existing combinations. If you head over to the Apple site right now, you'll no longer be able to purchase the Watch with the green or pink sports bands. 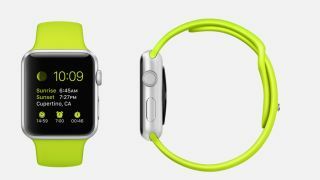 An Apple Store rep told techradar: "Starting today, the green band will not be purchasable with the Apple Watch", however it seems a few have vanished from the online shelves. The stainless steel case with black sport band has also gone - see? dead link - meaning you can only get that strap with the black steel case. You can still buy the bands separately although that's obviously going to cost you extra - quite a bit extra if you're buying official ones from Apple. Apple is probably rearranging the shop in respond to consumer demand so far, while making room for the new models, but it'll be annoying for anyone who had their eye on any of the now-extinct combinations. The iPad Pro is pretty damn big, but what's it like to play with?